Pssst … hey buddy! Yeah, you. Gotta hot tip for ya. Tired of these “down market” days? Wanna know when the coast is clear to buy stocks again? The gist of the report was that companies were buying back lots of their own stock — record amounts in fact. But as for executives’ own personal holdings? They were mostly sellers, having unloaded $10 billion in shares in August, the most in nine months. Insiders followed up by dumping nearly $6 billion in September — the highest volume of sales for that month in a decade. Keep in mind, insider selling happens all the time. Executives receive stock options as part of their pay packages. So, when shares are high, they’ll cash in (and sell the underlying stock) for windfall profits. That’s why monitoring insider buying is a more effective timing tool … especially when it hits rare extremes like during October’s market volatility. Give this market a little time. If it moves lower in the weeks ahead, it’s inevitable that it will move down to a level that will see a burst of buying from corporate insiders. When that happens, it’s time to pounce. As Total Wealth Insider Senior Analyst Brian Christopher has long noted, study after study proves it’s a smart move. He’s soon to roll out a trading service based on the trend of insider buying. University of Michigan finance professor Nejat Seyhun, a veteran researcher of the topic, noted in his 1998 book that “insider trading can provide valuable investment advice” and “is more informative that most other valuation yardsticks used in practice” such as price-to-earnings ratios, dividend yields and other standard measurements of value. 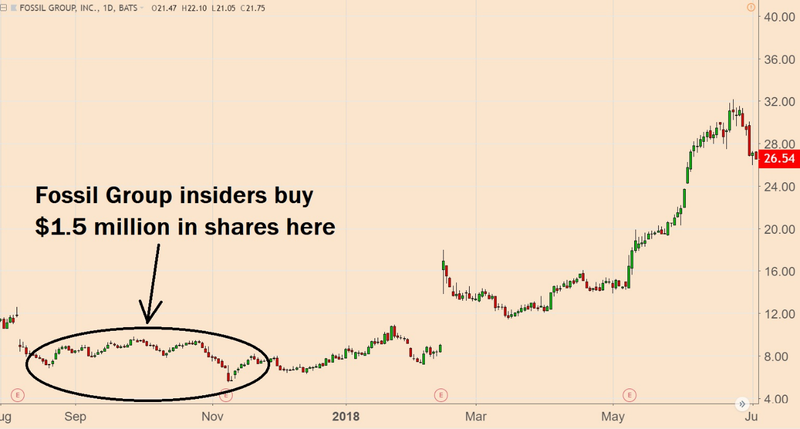 The most informative types of insider buys? According to the research, if you want the odds most in your favor, look for large “cluster” purchases made in the open market for cash (as opposed to cashing in stock options). Typically, these are stock buys made not just by a CEO, for example, but other “C-level” executives, as well as corporate board members — preferably within weeks or a few months of each other. A good example is the watchmaker Fossil Group Inc. (Nasdaq: FOSL). This time last year, you couldn’t find a more out of favor group of stocks than watch manufacturers. And no wonder, since the Apple Watch was scooping up market share left and right. Yet in August through November, a quintet of executives and board members bought up more than $1.5 million worth of Fossil’s stock at multiyear lows between $6 and $8 a share. Did they know something? They sure did. The stock zoomed from $6.69 on December 1 to $31 a share on June 25. So, if you want to know when it might be worth dipping a toe in the stock market again (or buy a favorite “beaten up” stock you’ve been watching for a while), keep your eye on insider trading. Sign Up for Jeff Yastine free newsletter and stay up to date with everything related to the markets!